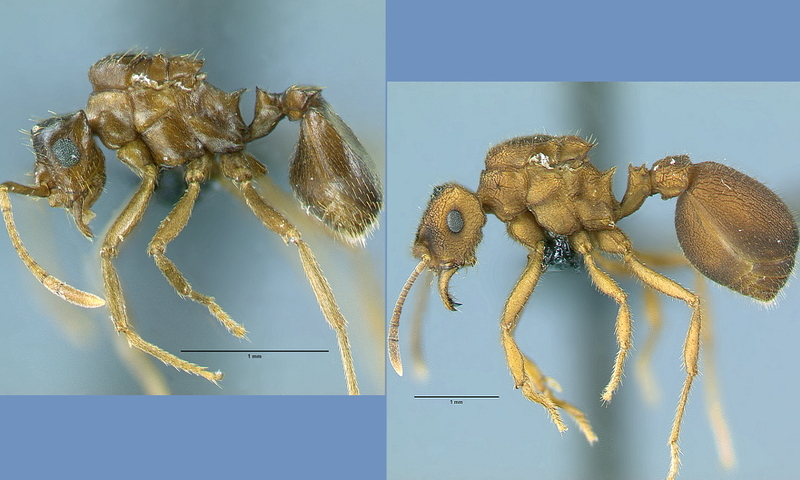 A newly-discovered species of ant supports a controversial theory of species formation. The ant, only found in a single patch of eucalyptus trees on the São Paulo State University campus in Brazil, branched off from its original species while living in the same colony, something thought rare in current models of evolutionary development. The findings by Rabeling and the research team were published today in the journal Current Biology. New species are formed when its members are no longer able to reproduce with members of the parent species. The commonly-accepted mechanism is called allopatric speciation, in which geographic barriers—such as mountains—separate members of a group, causing them to evolve independently. “Since Darwin’s Origin of Species, evolutionary biologists have long debated whether two species can evolve from a common ancestor without being geographically isolated from each other,” said Ted Schultz, curator of ants at the Smithsonian’s National Museum of Natural History and co-author of the study. “With this study, we offer a compelling case for sympatric evolution that will open new conversations in the debate about speciation in these ants, social insects and evolutionary biology more generally.” M. castrator is not simply another ant in the colony; it’s a parasite that lives with—and off of—its host, Mycocepurus goeldii. The hostis a fungus-growing ant that cultivates fungus for its nutritional value, both for itself and, indirectly, for its parasite, which does not participate in the work of growing the fungus garden. That led the researchers to study the genetic relationships of all fungus-growing ants in South America, including all 5 known and six newly discovered species of the genus Mycocepurus, to determine whether the parasite did evolve from its presumed host. They found that the parasitic ants were, indeed, genetically very close to M. goeldii, but not to the other ant species. They also determined that the parasitic ants were no longer reproductively compatible with the host ants—making them a unique species—and had stopped reproducing with their host a mere 37,000 years ago—a very short period on the evolutionary scale. A big clue for the research team was found by comparing the ants’ genes, both in the cell’s nucleus as well as in the mitochondria—the energy-producing structures in the cells. Genes are made of units called nucleotides, and Rabeling found that the sequencing of those nucleotides in the mitochondria is beginning to look different from what is found in the host ants, but that the genes in the nucleus still have traces of the relationship between host and parasite, leading him to conclude that M. castrator has begun to evolve away from its host. The parasitic ants need to exercise discretion because taking advantage of the host species is considered taboo in ant society. Offending ants have been known to be killed by worker mobs. As a result, the parasitic queen of the new species has evolved into a smaller size, making them difficult to distinguish from a host worker. Host queens and males reproduce in an aerial ceremony, in the wet tropics only during a particular season when it begins to rain. Rabeling found that the parasitic queens and males, needing to be more discreet about their reproductive activities, diverge from the host’s mating pattern. By needing to hide their parasitic identity, M. castrator males and females lost their special adaptations that allowed them to reproduce in flight, and mate inside the host nest, making it impossible for them to sexually interact with their host species. The research team included Ted Schultz of the Smithsonian Institution’s National Museum of Natural History, Naomi Pierce of Harvard University, and Maurício Bacci, Jr of the Center for the Study of Social Insects (São State University, Rio Claro, Brazil). Culver’s research was funded by NIGMS (National Institute of General Medical Sciences), a division of the National Institutes of Health.